Simplifies lines by removing relatively extraneous vertices while preserving essential shape. The Retain critical points (Douglas-Peucker) algorithm (algorithm='POINT_REMOVE' in Python) works by identifying and removing relatively redundant vertices to simplify data for display at smaller scales. It is the fastest of the simplification algorithms in this tool. This algorithm is often used for data compression or for coarse simplification. The angularity of the resulting lines increase significantly as the tolerance increases. This algorithm is based on the Douglas-Peucker algorithm: Douglas, David and Peucker, Thomas, "Algorithms for the reduction of the number of points required to represent a digitized line or its caricature," The Canadian Cartographer. 10(2), 112–22 (1973). 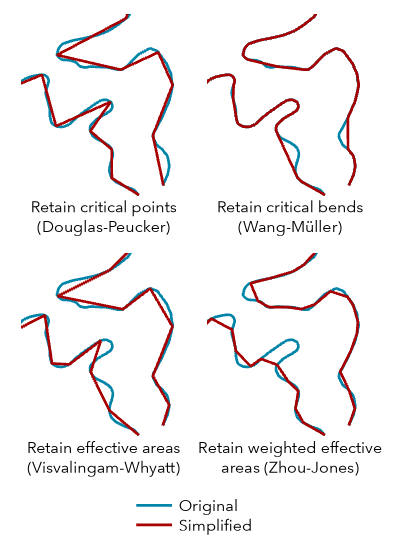 The Retain critical bends (Wang-Müller) algorithm (algorithm='BEND_SIMPLIFY' in Python) works by identifying and eliminating relatively insignificant bends to simplify data for display at smaller scales. It is typically more faithful to the input geometry than the Retain critical points (Douglas-Peucker) algorithm but can take more time to process. This algorithm is based on the algorithm defined in Wang, Zeshen and Müller, Jean-Claude, "Line Generalization Based on Analysis of Shape Characteristics," Cartography and Geographic Information Systems 25(1), 3–15 (1998). The Retain weighted effective areas (Zhou-Jones) algorithm (algorithm='WEIGHTED_AREA' in Python) works by first identifying triangles of effective area for each vertex. Those triangles are then weighted by a set of metrics to compare the flatness, skewness, and convexity of each area. The weighted areas guide the removal of their corresponding vertices to simplify the line while retaining as much character as possible. This algorithm is based on the algorithm defined in Zhou, Sheng and Jones, Christopher B., (2005) Shape-Aware Line Generalisation with Weighted Effective Area" in Fisher, Peter F. (Ed.) Developments in Spatial Handling 11th International Symposium on Spatial Handling, 369–80. The Simplification Tolerance parameter value determines the degree of simplification. The larger the tolerance, the more coarse the resulting geometry is. Smaller tolerances generate geometry more faithful to the input. MinSimpTol and MaxSimpTol fields are both added to the output to store the tolerance that was used. In the course of topology resolution, versions of the tool prior to ArcGIS Pro 1.4 modified tolerance on a per-feature basis and stored those values in the MinSimpTol and MaxSimpTol fields. Now the values in these fields will be the same and equal to the tolerance specified in the Simplification Tolerance parameter. Be sure to modify existing models or scripts that rely on any of these fields. For the Retain critical points (Douglas-Peucker) algorithm, the tolerance is the maximum allowable perpendicular distance between each vertex and the new line created. For the Retain critical bends (Wang-Müller) algorithm, the tolerance is the diameter of a circle that approximates a significant bend. For the Retain weighted effective areas (Zhou-Jones) algorithm, the square of the tolerance is the area of a significant triangle defined by three adjacent vertices. Use the Keep collapsed points parameter (collapsed_point_option in Python) to create an output point feature class to store the endpoints of any lines that are smaller than the spatial tolerance of the data. The point output is derived; it will use the same name and location as the Output feature class (out_feature_class in Python) but with a _Pnt suffix. The output line feature class contains all the fields present in the input feature class. The output point feature class does not contain any of these fields. The output line feature class is topologically correct. Any topological errors in the input data are flagged in the output line feature class. The output feature class includes two additional fields: InLine_FID and SimLnFlag that contain the input feature IDs and topological errors of the input, respectively. A SimLnFlag value of 1 indicates a topological error is present; 0 (zero) indicates that no errors are present. Prior to the ArcGIS Pro 1.4 version of this tool, topological errors could be generated during processing. The Check for topological errors (error_checking_option in Python) and the Resolve topological errors (error_resolving_option in Python) parameters were included to identify and optionally resolve these errors. These parameters are still included in the tool's syntax for compatibility in scripts and models but are now ignored and are hidden from the tool's dialog box. The SimLnFlag field was used to flag topological errors introduced by the tool in processing. Now this field flags errors present in the input. Use the Input barrier layers parameter to identify features that must not be crossed by simplified lines. Barrier features can be points, lines, or polygons. Domains and subtypes are copied to the output even if the Transfer field domain, subtypes and attributes rules environment is unchecked. Processing large datasets may exceed memory limitations. In such cases, consider processing input data by partition by identifying a relevant polygon feature class in the Cartographic Partitions environment setting. Portions of the data, defined by partition boundaries, will be processed sequentially. The resulting feature class will be seamless and consistent at partition edges. See Generalizing large datasets using partitions for more information. The input line features to be simplified. The simplified output line feature class. It contains all fields present in the input feature class. The output line feature class is topologically correct. The tool does not introduce topology errors, but topological errors in the input data are flagged in the output line feature class. The output feature class includes two additional fields: InLine_FID and SimLnFlag to contain the input feature IDs and the input topological errors, respectively. A SimLnFlag value of 1 indicates an input topological error is present; 0 (zero) indicates that no input error is present. Specifies the line simplification algorithm. POINT_REMOVE — Retains critical points that preserve the essential shape of a line and removes all other points. This is the default. BEND_SIMPLIFY — Retains the critical bends and removes extraneous bends from a line. WEIGHTED_AREA — Retains vertices that form triangles of effective area. The tolerance determines the degree of simplification. You can choose a preferred unit; otherwise, the units of the input will be used. MinSimpTol and MaxSimpTol fields are added to the output to store the tolerance that was used when processing occurred. For the POINT_REMOVE algorithm, the tolerance is the maximum allowable perpendicular distance between each vertex and the new line created. For the BEND_SIMPLIFY algorithm, the tolerance is the diameter of a circle that approximates a significant bend. For the WEIGHTED_AREA algorithm, the square of the tolerance is the area of a significant triangle defined by three adjacent vertices. This is a legacy parameter that is no longer used. It was formerly used to dictate how topological errors, possibly introduced during processing, were handled. This parameter is still included in the tool's syntax for compatibility in scripts and models but is hidden from the tool's dialog box. Dictate whether to create an output point feature class to store the endpoints of any lines that are smaller than the spatial tolerance. The point output is derived; it will use the same name and location as the out_feature_class but with a _Pnt suffix. KEEP_COLLAPSED_POINTS —Record the endpoints of zero-length lines in a derived output point feature class. This is the default. NO_KEEP —Do not create a derived output point feature class. Inputs containing features to act as barriers for simplification. Resulting simplified lines will not touch or cross barrier features. For example, when simplifying contour lines, spot height features input as barriers ensure that the simplified contour lines will not simplify across these points. The output will not violate the elevation as described by measured spot heights. When the Keep collapsed points parameter (collapsed_point_option in Python) is used, an output point feature class is created to store the endpoints of any lines that are smaller than the spatial tolerance of the data. The following Python window script demonstrates how to use the SimplifyLine tool in immediate mode. The following stand-alone script demonstrates how to use the SimplifyLine tool. # with value 40 for rivers and 80 for coastlines. # and put them in separate feature classes.